In March 2006 UNESCO published a cd-rom as the result of a two-year research undertaken in four regions aiming to synthesise regional projects and programmes which innovatively exploit synergies between formal and non-formal education. What makes this study so interesting from my humble perspective is that the four regions covered are Latin America, Asia and Pacific, Arab States and Africa. You see Europe here anywhere? Well, I’d say enjoy the change of perspective. Because what the work of UNESCO and UNLD-LIFE shows (beyond all which it shows anyhow) is how particular and constrictive the European discourse on non-formal education and learning tends to be. It exemplifies some of the issues evolving around non-formal education as a policy in development aid, as a prevention tool, as the only alternative to learning there is. Surely this perspective brings its own limitations but is very well worth your valuable time! “Until recently, education planning tended to disregard the non-formal education sector that most successfully meets the needs of marginalized and vulnerable populations around the world. This report is a first step in showing how national Ministries of Education in four regions (Latin America, Asia and Pacific, the Arab States and Africa) are beginning to create â€œsynergiesâ€ with non-formal education providers towards bridging that gap. In light of the research outcomes, this report has been able to take stock of a broad range of implementation arrangements, concerns and achievements in relation to the synergy between formal and non formal education. Case studies and field experiences highlight models of good practice while reflecting the dynamism, richness and enthusiasm of NFE interventions in different countries. This report however does not provide any one interpretation of synergy nor does the study claim to be exhaustive. Instead, such relationships are situated against the socio-economic and cultural contexts and challenges facing different population groups. How can learning within formal education systems take into account the diversity of learning situations, and the urgency of the specific needs of socially excluded communities and individuals, while paying respect to their social practices and cultural traditions? How do we ensure representation of the most vulnerable and encourage their participation? In what ways are partnership arrangements helpful? What are the innovative elements in different types of synergies? What may still be missing from the reform process in terms of advancing the broad aims and improving access to education and educational management? 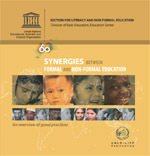 Download the publication over at UNESCO’s website (careful, the pdf is 19 MB heavy). The EU is struggling – and learning?